At 5:00 p.m. Paul Klein will give a walk through and make remarks. Address: 711 N. Main St., Rockford, IL. Caroll Michels, an artist-advocate, career coach, and author was selected as the June 2009 guest in the “Living Hero” series, produced and hosted by visual artist and poet Jari Chevalier. This was Michels’ second interview in the series – conducted in conjunction with the publication of the sixth edition of her book How to Survive and Prosper as an Artist: Selling Yourself without Selling Your Soul (New York: Henry Holt and Company, June 2009). The 38-minute interview – which can be streamed or downloaded at http://jari.podbean.com -- covers a diverse range of topics, including: have things really changed in the art world? ; what is new in the world of art marketing; what are the odds of acceptance? ; what is possible for the creative spirit? ; artists and authority figures; current leverage points for artist-advocacy; social networking sites; secret code Web site pages; using print-on-demand services; Picasso’s confession; and Caroll Michels’ dance immersion. “The series is devoted to explorers, pioneers, mavericks, and brave hearts who are cutting new pathways of thought, knowledge and action to help and serve the rest of us in the here and now. These are people who often have their eyes on the future: They are, in this sense, visionaries,” said Jari Chevalier, founder of the series. Caroll Michels served as chairperson of the Fine Arts Advisory Board of the Fashion Institute of Technology in New York City. She was also on the faculty of the New School for Social Research. Her artwork has been exhibited in museums and cultural centers in the United States and abroad, including the Georges Pompidou Museum in Paris; the Walker Art Center in Minneapolis; and Exit Art and the Institute for Contemporary Art/The Clocktower in New York City. Michels has received numerous grants, including those awarded by the National Endowment for the Arts, the New York State Council for the Arts; the New York Council for the Humanities; and the International Fund for the Promotion of Culture/UNESCO. She was a fellow at the Alden B. Dow Creativity Center, Northwood University, in Midland, Michigan. She is the founder of the Artist Help Network (www.artisthelpnetwork.com), a launching pad to help fine artists mine resources on career development and career challenges. In the fall 2009, she will teach a course based on her book at the Ringling College of Art and Design, Continuing Studies and Special Programs, in Sarasota, Florida. Press Release: President Obama's Barbershop premieres their touring art exhibiton, which focuses on the art & nature of barbering from 1927 to now. "The Seated Stories of Hyde Park Hair Salon"
Hyde Park Hair Salon opened it doors in Hyde Park in 1927 and has serviced many great figures, visitors, and long time clients along with their most prestigious client President Barack Obama. On July 12, 2009 they will present a preview of their highly anticipated exhibition Seated Stories that explores and celebrates the art and tradition of barbering from 1927 to the present. The preview exhibition will be a mixed media exhibit featuring works form commissioned artists. The exhibition will preview at the Aloft Hotel, 9700 Balmoral Ave. in Rosemont, IL on July 12, 2009 from 3:00-6:00p.m.and is free and open to the public. Seated Stories will debut the complete exhibition late fall 2009 at Hyde Park Hair Salon, "The Official Barbershop of President Barack Obama". The exhibition will then tour Chicago for one month before traveling to Atlanta, GA and then on to several nationwide galleries and museums to be announced at a later date. Seated Stories is a precursor to a highly anticipated much larger art exhibit that invites viewers into the world and culture of the barbershop and the nature and art of barbering. Because the barbershop has been and continues to be an institution in American culture, Seated Stories highlights the changes and transformations it has undergone throughout the years. It also takes a closer look at the meaning and significance of the barbering culture while gaining a greater appreciation of its aesthetic impact. Viewers will also discover its rich traditions that continue to influence present-day grooming experiences. The barbershop has been a place for all men regardless of stature, profession, or character. It is a place where status and stratification lines disappear. The barbershop is a rare place in which everyone is equal and everyone's opinion counts. It has long been a podium for venting, bragging, laughing, learning, sharing, and a place for solitude for many men. Seated Stories features original paintings, sculptures, and limited edition Glicee' prints that embody the history, culture, and art of barbering in the Hyde Park Hair Salon. Hyde Park Hair Salon is a historical landmark, located in the Hyde Park community for over 80 years. It is the third oldest business in the Hyde Park community which is considered one of Chicago's most culturally rich and diverse Southside neighborhoods. Hyde Park Hair Salon was established in 1927 just a few blocks north of the historic Frank Lloyd Wright Robie House and is a short stroll from the steps of President Barack Obama's Chicago home. The charity event and exhibition titled Seated Stories is organized by the Hyde Park Hair Salon owners Monique and Ishmael Coye. When one encounters Ginny Sykes’ exhibition Alchemy and Archetype they are immediately drawn into an intimate and powerful dialogue. Sykes first engages the viewer by luring the eye toward a complex series of arresting gestures and markings in pencil and charcoal. As the eye traverses these paths, the onlooker also begins to absorb and contemplate a range of archetypal forms. These symbols, such as silver’s association with both personal and creative reflection, allow Sykes to explore female experience and embodiment, but in a manner that resists imposing universals or monolithic ideals. 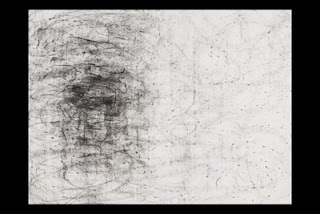 Instead, it is precisely the abstract nature of Sykes’ abstract drawings that permit multiple points of entry for viewers and encourages contemplation of their own histories. Sykes further recognizes abstraction as a possible site of subversion and feminist intervention by embracing multifaceted meanings over fixed positions, which ultimately challenges modernism’s inherently patriarchal and authoritarian voice that all too often participates in women’s art historical erasure. Without further action on the budget, state funding for the arts will be drastically reduced. To protect the arts infrastructure in Illinois, it's going to take all of us working together. Please act now and urge your elected officials to stand up for the arts and arts education by passing a responsible state budget. From Senator Heather Steans (D-7-Chicago), who received 222 messages from arts advocates since May and voted for a sensible budget solution: "Arts funding offers jobs, after school programs, free public programs, and educational programs that benefit our community. I am worried that cuts to these programs will worsen our economic situation by cutting jobs and lessen community safety by removing some of the few programs that provide youth in my district with something positive to do after school. I will be fighting to keep these programs funded." From Representative Naomi D. Jakobsson (D-103- Champaign), who received 55 messages from arts advocates since May and also supported a responsible budget solution: "The arts play an officials hear from the people they represent," Representative Jakobsson continued. "There's no better way for us to understand community views and opinions than to hear directly from the people of the district." The General Assembly is expected to return to Springfield on July 14. As news on the state budget becomes available, the Arts Alliance will keep you informed. Sandra Holubow's son, Eric Holubow, is an award winning photographer whose work is part of the Catherine Edelman Gallery online gallery, "The Chicago Project." Some of his pieces have been chosen to be part of an exhibit, "The Chicago Project III," in the gallery at 300 W. Superior Street. The show opens Friday, July 10, with an opening reception 5:00--8:00 PM. The exhibit will close September 4, 2009. 312-266-2350.